Recent studies suggest that a combination of enamel matrix derivative (EMD) with grafting material may improve periodontal wound healing/regeneration. Newly developed calcium phosphate (CaP) ceramics have been demonstrated a viable synthetic replacement option for bone grafting filler materials. This study aims to test the ability for EMD to adsorb to the surface of CaP particles and to determine the effect of EMD on downstream cellular pathways such as adhesion, proliferation, and differentiation of primary human osteoblasts and periodontal ligament (PDL) cells. EMD was adsorbed onto CaP particles and analyzed for protein adsorption patterns via scanning electron microscopy and high-resolution immunocytochemistry with an anti-EMD antibody. Cell attachment and cell proliferation were quantified using CellTiter 96 One Solution Cell Assay (MTS). Cell differentiation was analyzed using real-time PCR for genes encoding Runx2, alkaline phosphatase, osteocalcin, and collagen1α1, and mineralization was assessed using alizarin red staining. Analysis of cell attachment revealed significantly higher number of cells attached to EMD-adsorbed CaP particles when compared to control and blood-adsorbed samples. EMD also significantly increased cell proliferation at 3 and 5 days post-seeding. Moreover, there were significantly higher mRNA levels of osteoblast differentiation markers including collagen1α1, alkaline phosphatase, and osteocalcin in osteoblasts and PDL cells cultured on EMD-adsorbed CaP particles at various time points. The present study suggests that the addition of EMD to CaP grafting particles may influence periodontal regeneration by stimulating PDL cell and osteoblast attachment, proliferation, and differentiation. Future in vivo and clinical studies are required to confirm these findings. The combination of EMD and CaP may represent an option for regenerative periodontal therapy in advanced intrabony defects. 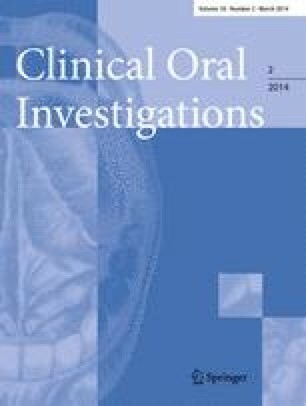 The authors gratefully acknowledge the Robert K. Schenk Laboratory of Oral Histology, School of Dental Medicine at the University of Bern, most notably Thuy Tran Nguyen and Monika Aeberhard for their considerable time and valuable insights into the project design. This work was funded by the Department of Periodontology at the University of Bern and Institut Straumann AG (Basel, Switzerland).